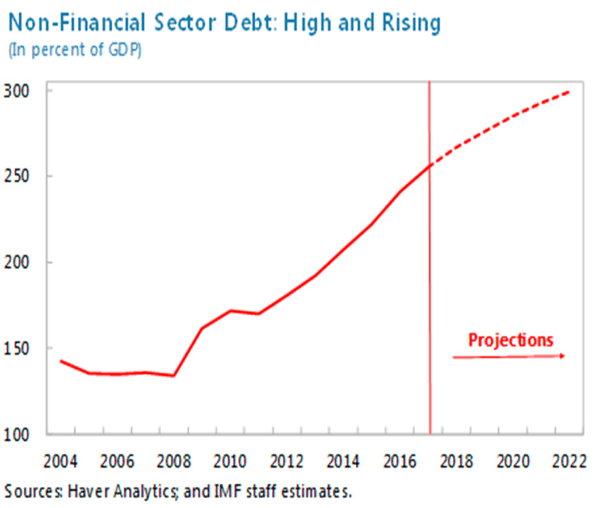 This article looks at some of the issues surrounding Chinese debt, and questions where China will now go. No one can be authoritative on this subject, unless they believe six impossible things before breakfast, but my intention is to contribute to a discussion. The question of excess Chinese debt has attracted much attention over the last two years, but it seems that most authorities are in disagreement as to its effect, and the factors driving it. It is an enigma, because the normal logic, which applies in Western capitalist economies does not apply in China. China is a controlled economy, and the Chinese Communist Party determines policies, sets targets for example for GDP, which are followed, and then finds it difficult to reconcile the effects of different policies. However, it is important to remember that in China politics will always be paramount; that is the survival of the Chinese Communist Party, not the rule of law, regulations, or economics. This is a managed, not an open, system. One example is the reluctance of the Chinese Communist Party to close down unprofitable and non-performing (zombie) State Owned Enterprises (SOEs), which employ large numbers of people. There is a real fear that such policies would create wide-scale social unrest, a threat to the party. In many respects, you can see the modern Chinese economy as a rerun of the Sorcerer’s Apprentice, which was part of the Disney film Fantasia in 1940. In the film Mickey Mouse cannot control the water coming from the many buckets he has created by magical means. There are two consequences that result from China’s unprecedented level of investment, firstly, industries like steel have now reached levels of production, which cannot be supported by the Chinese economy, their profitability has therefore fallen, and their debt payments have risen; they have the same problem as Mickey Mouse. The second consequence, is that much of the investment has been made in non-performing assets, the “ghost cities“, which have no population, are an obvious example. I also remember an anecdote from a businessman, he and his colleague booked into a hotel near to Beijing, on the first day they chose one of the five restaurants, apart from themselves there were no other guests, the next day they eat at another restaurant in the hotel, it was also empty, they then asked how many guests were staying in this hotel, which had a 1,000 bedrooms; they were the only guests. It is not an exaggeration to say that China has invested in huge numbers of empty apartment buildings, airports which can only serve a handful of customers, railways to tiny communities, and bridges to nowhere. The Chinese economy has become addicted to the creation of assets which will never return profits, or in any way justify the capital spent on them, and it is the debt servicing of such projects which hangs like an albatross around the neck of the Chinese economy. In order to raise additional capital, Chinese institutions have many cases issued fraudulent bonds, or an effect engaged in Ponzi schemes. Chinese courts and regulators have normally blamed individuals, rather than the banks they work for, where such cases have come to public attention, but this is not due merely to local corruption, this is a systemic problem, which lies at the heart of the Chinese economy. Chinese state companies, and local government authorities, have issued enormous quantities of bonds, and other financial instruments, the only purpose of which is to keep alive non-performing state companies, or to undertake large-scale development in cities and regions; investments which are unlikely to generate sufficient profits in future years in order to cover their interest charges. Large-scale corruption at local government level, in particular connected with housing and other forms of property development, has benefited officials, who are well paid by developers for their cooperation and support in removing peasants from farmland and granting planning approvals. This behaviour has also been driven by Communist Party policy to promote growth at local level. Much of the capital flight of recent years has been driven by corrupt officials, moving their gains to Hong Kong, and then to countries like Canada and Australia. To the outsider the rapidly escalating levels debt in China are a paradox, it is difficult to see why, if China is really a very successful economy, as is often maintained, generating large amounts of profitable exports, and sizeable inward investment. But the reality is that the Chinese economy is unbalanced, and that large parts of it are dysfunctional. China today can be compared to an American householder, whose income is inadequate to support his lifestyle, and who resorts to maxing-out a series of credit cards, or even borrows from a payday lender. There can be no happy ending in such a situation. Bloomberg estimated that, as of June 2016, Chinese asset-management products (AMPs), mostly held off-balance sheet, were worth $8.7 trillion (75% of China’s GDP); wealth management products (WMPs) were worth $3.8 trillion, or $12.5 trillion in total. Approximately 25% of WMPs are invested in property and construction, sectors vulnerable to market corrections. WMPs are also investing in each other, generating increased systemic risk. In November 2017 China’s regulators announced that they will overhaul the regulation of asset management products, which are worth about $15 trillion, and the authorities have recently acted against some obvious scans, including the issue of fraudulent letters of guarantee by the staff of Guangfa Bank in Guangdong. According to The South China Morning Post the case involved as much as 12 billion yuan (about $1.8 billion), “as the bank tried to channel money to cover its mounting bad loans and operational losses.” China Minsheung Banking Corporation was also fined, in another case, for selling fake wealth management products. Foresea Life Insurance and Anbang, were also banned, earlier in 2017, from issuing new products. The China’s financial system has developed rapidly in size and complexity, and is now as one of the world’s largest with financial assets at nearly 470% of GDP. There are no signs that the Chinese government understands how it can rebalance its economy to move wealth from local government, failing state enterprises, and property companies to the household sector. While it is impossible that China can continue to support its current financial system indefinitely, it is not obvious how the Chinese government can change policy at this stage, without creating and era of stagnation similar to that experienced by Japan in the 1980s. Although the World Bank believes that Chinese growth can remain above 6 1/2% for the next 20 years, I believe that this is actually impossible, and that at some time within the next few years Chinese growth will collapse, to levels of around two to three percent p.a. There are two other important points to make, one is that the problems with corruption are not the case of a few bad apples, this is a systemic problem, common throughout the Chinese economy; it is a natural outcome of the circumstances and policies. The second point, which was made in the Oxford Review of Economic Policy in 2016, was that over the last 10 years much of the investment made by China is actually been in non-performing assets, that is investments which will never pay the capital and interest expended on them, and which will become a drain on the country’s economy as China struggles to repay these immense capital costs. As the authors of the paper conclude: “The question of whether infrastructure investment leads to economic growth must be answered in the negative. Owing to uncertainty surrounding costs, time, and benefits parameters, a typical infrastructure project fails to deliver a positive risk-adjusted return. There is a common tendency for the benefit-to-cost ratio of major infrastructure investments to fall below 1.0. Such unproductive projects detract from economic prosperity. We thus reject the orthodox theory that heavy investment in infrastructure causes growth.” On this basis, the planned investment in the One Belt One Road is unlikely to benefit China. I do not believe that China is going to collapse, although over the next few years the control of the Chinese Communist Party will be challenged; rather China may follow the Soviet Union, or Japan, into stagnation and loss of value. Western policy should be cautious, there is no need to challenge China; it has very serious problems of its own, and it is in the interests of the global economy that China stabilizes in such a way that it does not generate a systemic global impact. China will remain an important part of the global economy, but the glory days of double-digit growth are now over, and the prices of raw materials will stabilize at pre-boom levels. China is a much more troubled and unbalanced economy than most outsiders understand. Excessive investment means that China’s productive capacity, especially in core products like steel and ship building, now greatly exceeds demand. China has not acted effectively to reduce this excess capacity; this sets the scene for dumping in foreign markets, and arguments at the WTO. It is worth bearing in mind that China and Hong Kong both performed badly as regards BIS’s 2017 stress indicators in domestic banking systems, with Credit-to-GDP gaps of 24.6 and 30.3 respectively, the highest for any major economy. © Andrew Palmer, 2017 please do not reproduce without permission.